Professional top-of-the-line glove. Made from the finest supple leather, Leather palm. Leather back. Leather cuff. Generous sized catching pocket. Leather reinforcement on high-wearing areas of fingers and knuckles. Two large nylon net inserts at back for optimum ventilation. 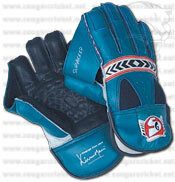 As used by Dinesh Karthik, Rahul Dravid and Pathiv Patel.